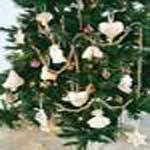 Nothing will get you into the Christmas spirit like sewing your own Christmas decorations and crafts with free Christmas sewing patterns. 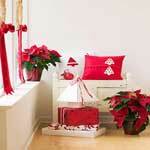 Decorating for Christmas gives our homes that warm and welcoming feeling that everyone enjoys during the holidays. 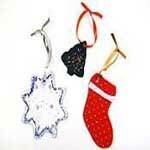 Adorn the Christmas tree with an array of homemade ornaments. 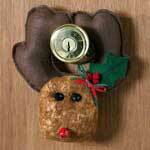 Make beautiful wreaths and doorknob hangers to place all through the house. 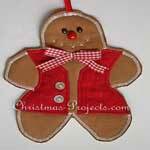 And there are lots more Christmas sewing ideas below. Create loving family memories this Christmas in a home filled with the Christmas spirit you made yourself. 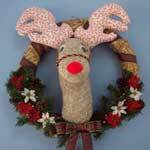 Make a stuffed red nosed reindeer wreath with these instructions. 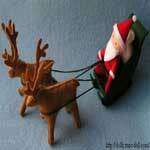 Complete instructions with pictures to make a tiny Santa Claus on the sleigh with two reindeer. 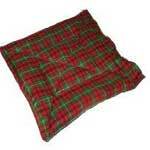 Add a punch of color and some holiday cheer to your decor with this comfy red pillow. 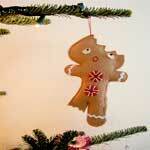 Make these gingerbread man ornaments for your tree or to decorate a package. Wow. 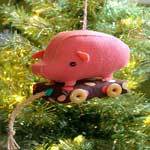 This is the cutest little pig and would look great on the Christmas tree. 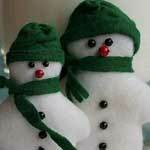 Mr. & Mrs. Snowman have a smile on their face and look full of Christmas spirit. 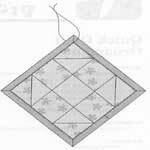 Here are easy-to-follow instructions with a material list to help you make this pretty quilted ornament. 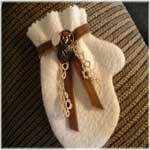 Here's a tutorial to make a decorative mitten ornament for tree or package. This sweet little gingerbread man has a bite taken from his head & leg. So original! 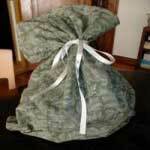 You can make these gift bags out of fabric left over from other projects. 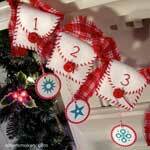 Strung on a long strip of homespun, these advent pockets add to any Christmas tree decor. 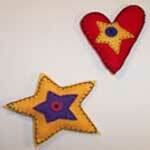 Attach tiny ones to a Christmas tree or if you make a big one, it can be a cushion. Santa never looked better. Follow these step by step instructions with pictures. 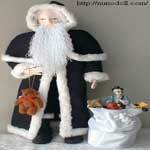 This Santa is 18 inches in height and has a bag full of goodies. 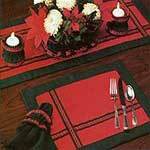 Make these to match your dining décor, and use them year round. 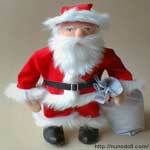 Pick from tons of different Christmas crafts, such as Santa, wreaths, ornaments and more. 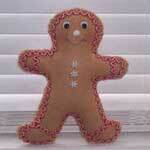 All dressed up in his finest, you can sew this warm and cheery guy within a couple of hours. 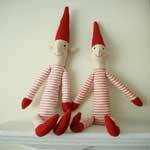 Take a look at these cute Christmas pixie dolls and make one or two for yourself. Placing a hot pot on these mats causes the cinnamon inside to come through and smells so good. This project calls for holiday cookie cutters and is so simple and quick too. Use bright colors to make these alternative holiday ornaments. 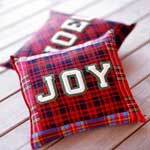 Make these cute pillows that spell out the holiday joy. 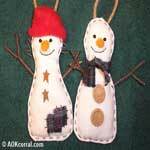 This is an easy and fun project for the person who enjoys making holiday decorations. 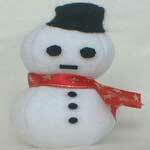 You may change the hat and scarf colors on these fellas to match your decor. 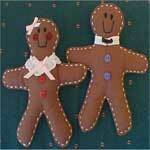 Complete crafting instructions and full sized gingerbread man pattern can be found here.